Get quality report forms and customized for coating applicators to record paint application data. Use this page to search our library of template inspection and test plans (ITP) and product inspection forms (PIF) tailored to meet the requirements of many specifying or Standards authorities including; ASTM, Australian Standards AS2312, ISO 12944, Norsok M-501, Exxon Mobil Global Practices, SSPC, NACE International. We also have many test report forms (TRF) for protective coatings including; Holiday testing, porosity testing, testex tape, surface profile, adhesion testing among many others. We also have ready reckoners to assist with paint usage calculations for Dry Film Thickness (DFT) and Wet Film Thickness (WFT). These are available in microns and mils. 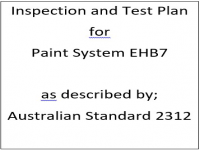 This Inspection and Test Plan (ITP) is used for immersion coating systems for carbon steel in potable water that require abrasive blast cleaning and two-coat application using a high build epoxy (EHB) to Australian Standards.